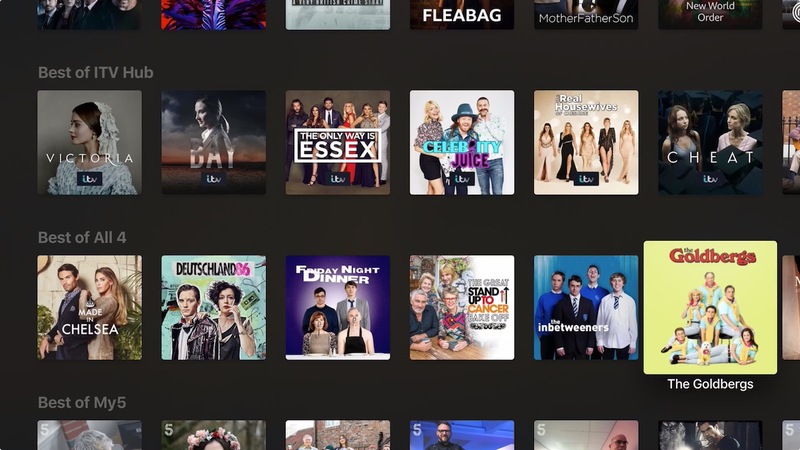 Late last year, United Kingdom broadcaster Channel 4 released a tvOS app for its "All 4" on-demand streaming service, allowing viewers to stream the channel's shows for free on Apple TV. This week, the All 4 app updated with integration for Apple's TV app, meaning that all of the shows that users watch in the All 4 app will sync in their Up Next queue in the TV app. All 4 shows will also appear as part of recommendations in the TV app now, making it much easier as a whole for viewers to keep track of their show binges within the TV app. The All 4 tvOS app is not available in the United States at this time. Channel 4 is the home of many well-known shows like The Great British Bake Off, the UK version of Big Brother, the original Black Mirror, Misfits, and The IT Crowd. It also hosts a few imported series like Community, 30 Rock, and The Goldbergs. To gain access to these shows and movies, all users need to do is create and sign into a free My4 account. 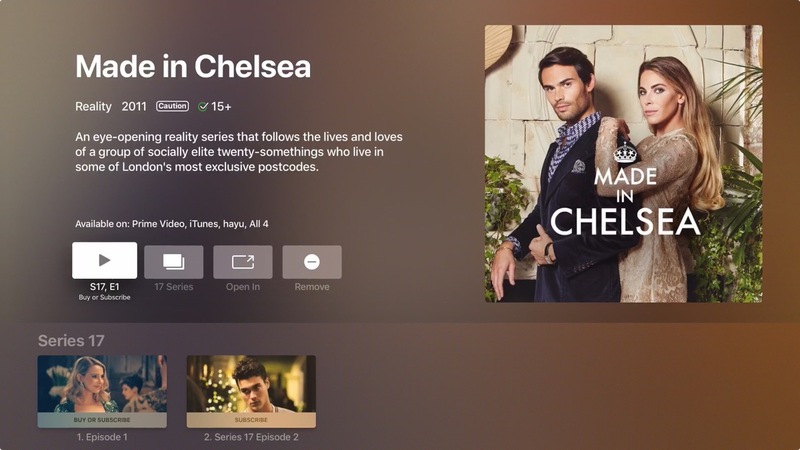 Late last year, United Kingdom broadcaster Channel 4 ('https://www.channel4.com/') released a tvOS app for its "All 4" on-demand streaming service, allowing viewers to stream the channel's shows ('https://www.macrumors.com/2018/12/18/channel-4-releases-all-4-app-for-apple-tv/') for free on Apple TV. This week, the All 4 app updated with integration for Apple's TV app, meaning that all of the shows that users watch in the All 4 app will sync in their Up Next queue in the TV app. It’s over to you UKTV Play. Overall I'm delighted to have All4 on the Apple TV. I just wish they'd have a more elegant solution for ad breaks. The ad breaks on Hulu are quite annoying but at least there's a countdown and you know you have 90 seconds to leave the room and come back. Channel 4 app needs live TV feature, simple to implement, just get it done. UKTV would be a welcomed addition too. That good. All4 and ITV I can use and watch because they rare few have subtitles on Apple TV app. Some reason BBC iPlayer be stubborn refuse subtitles on Apple TV and keep saying subtitles isn’t compatible with Apple TV even iOS app do have subtitles! Annoying. UKTV useless for me. No subtitles whatsoever. I have no idea how subscription service like Netflix have subtitles or not cos I check like over 5 years ago they didn’t and not bother check again. this, this and 1000 times this! $ky need to hurry up and update this awful app. I signed up a few weeks ago to binge GOT before it restarts. It’s unbelievable how bad the app is. How could they overlook adding ‘recently watched’ or ‘resume playing’ sections? Not to mention that it looks like a first gen Apple TV app. Good news. Now if only Apple could find away to integrate all iTunes library content on to the TV App. What doesn’t? My renting and purchases are on TV app. On the other hand BT’s two Apple TV apps are really good apart from the lack of TV app integration. [doublepost=1554231079][/doublepost]Urm? Is it just me who can’t get All4 episodes to play from the TV App on the Apple TV? They’ll open the All4 app on iOS but on TvOS nothing happens if I click on anything. Great news. Now if only the quality was better than 480p. Looks good if I squint! Integration appears to be broken as of this morning. Seen two other instances reported on twitter. Shows no longer appear in the up next carousel and while the best of All 4 section still appears you can't launch the shows and search is unable to find no All 4 content currently. All 4 has been removed from my connected apps list even though it appears in the app count. Couldn't agree with you more about UKTV Play, think I'll be old and grey before that happens.....I'm amazed Apple hasn't gone after them for content before now. NowTV need to get on and release their long awaited updated app as well.